My son’s interest in the Latin language, fuelled by his engaging Latin teacher, remains unbroken. Recently, for example, he wished to discuss the authenticity of some volumes of John Maddox Roberts‘s beautifully entertaining SPQR series with me (to a depth that should leave the production team of the 2014 Pompeii film red-faced). 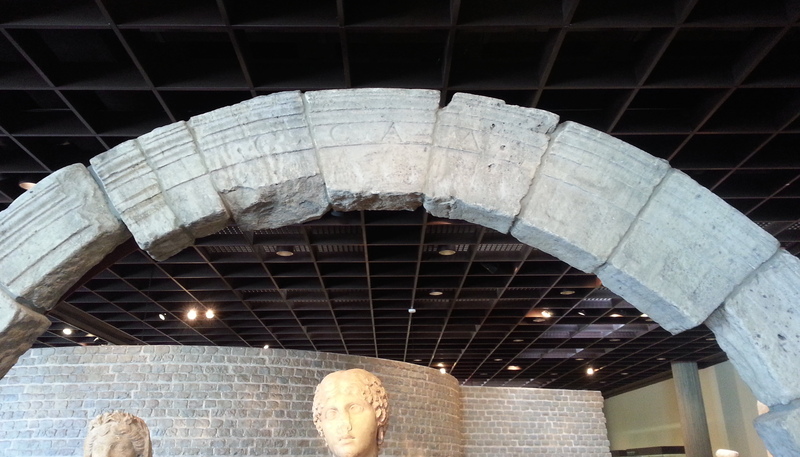 Roman city gate of the CCAA, imaginatively inscribed with … CCAA. Römisch-Germanisches Museum, Cologne. – Photo: PK, 2014. In order to provide some further inspiration, we decided to spend a few days of this year’s Easter vacation in the German city of Köln, Cologne, or, as my son preferred to call it (by its full Latin name), Colonia Claudia Ara Agrippinensium, or shorter: CCAA. In Roman times, Cologne was the capital of Germania Inferior, and, consequently, it is unusually rich in Roman remains – many of which are on display in the Römisch-Germanisches Museum, next to Cologne’s iconic cathedral. During our visit we had endless hours of fun in this magnificent museum, and – in addition to time spent on exploring the digital 3D reconstructions of Roman Cologne – my son spent a significant amount of time studying the Latin inscriptions that were on display. A similar amount of fun was had in the underground exhibition of the so-called Praetorium, where the foundations of the palace of the provincial governor of Germania Inferior survive to the present day. One of the recurring features of the Latin inscriptions (of Cologne just as much as everywhere else, of course) is mention of gods or other spirits – dei, deae, divi, divini. This reminded him (and me) of a question he had asked a few weeks earlier, and which I had shamefully delayed to answer: is there a link, etymologically, between divus (‘godlike’) and divinus (‘divine’) on the one hand and dives (‘rich’) on the other? Or, as my son had put it in a Skype conversation, just to puzzle his already perplexed father a little further … suntne divini divites? The answer is … probably yes, actually. Divus, as Latin deus, is related to an Indo-European root that signifies ‘heaven’ or ‘sky’ (incidentally, the same root that survives in the English word ‘Tuesday’ and German ‘Dienstag’). Dives, in turn, has been explained in relevant etymological dictionaries as an adjective that denotes the (pecuniary) power of someone upon whom the gods do smile – in a similar way in which fortuna-tus may refer to someone who has been blessed, financially, by Fortuna. Morphologically, the word formation appears to follow a simple logic: a dives being someone whose influence (and affluence) is based on the approval of the divi just as an eques (‘knight’, ‘horseman’) is someone whose might is based on the power of equi (‘horses’). My son studying Latin inscriptions in the Cologne Praetorium exhibition. – (c) PK, 2014.
dives a divo, qui ut deus nihil indigere videtur. In other words: even in the Late republic, the cognate nature of the two words, divus and dives had been assumed – and one could push this rather further still, e. g. by way of reference to the Greek concept of eudaimonia (‘wealth’, literally ‘a state of being accompanied by good spirits’) or, in fact, the name(s) of Ploutos-Plouto(n), the Greek god(s) of the Underworld and/or Riches. whose names quite literally translate as ‘Wealth’, a notion preserved also in his Latin counterpart Dis (obviously related to the same root as the aforementioned terms). We allow certain things to obtain their name from opposites, like ‘Dis’, for he is not rich at all. This definition follows the logic of the so-called antiphrasis, for which the neatest Latin example is the infamous canis a non canendo (‘a dog is called a dog because it can’t sing’). At any rate, as far as etymology is concerned, matters appear to be clear – the notion of divus, godly, gives rise to the notion of dives, rich. Yet, the way in which my son had phrased his question in Latin – suntne divini divites – is an open invitation to reflect some more on the relationship between the two, for, due to the beautifully ambiguous word-order, it could mean both ‘are the gods rich’ just as much as it could mean ‘are the rich divine’. The former appears to be implied in the etymology. But what about the latter . . . ? censetur censu ad Accheruntem mortuos. Only the gods are rich, and displays of power and connections are only appropriate for the gods; but we are mere men: as soon as we let go of the little seed of our soul, the beggar in his death is rated with an equal rating in the Underworld as the richest of men. The speaker of this passage, an old-man character called Philto, offers his musings on Death, the great leveller: death does not only lift the boundaries between rich and poor, but also draws a clear line of distinction between the divine and mere mortals, for only the former may keep their possessions in eternity. mirum quin tu illo tecum diuitias feras. ubi mortuos sis, ita sis ut nomen cluet. Surprised if you weren’t going to find a way to take your riches with you there. When you’re dead, be dead in a way that the name is chiming. This comment has resulted in numerous attempts at correcting the words, or coming to terms with its meaning. What is clear is that it ought to be (a) a funny, (b) ironic, and (c) potentially snide remark, not an attempt at out-philosophising Philto’s words. My best bet would be that Stasimus says that (i) he’d be very surprised if close-fisted Philto weren’t going to find a way to take his money with him, and that (ii) if he in fact didn’t after all, he’d finally live up to the promise of his name, Philto (a name derived from Greek φιλεῖν, ‘to love’). Generosity of a father or a patron, in Roman plays, as e. g. Cynthia Damon in her book on parasites and patronage in Roman comedy has demonstrated, is indeed something that has the potential to make said person appear almost god-like in the eye of the son or client. ea qui praebet, non tu hunc habeas plane praesentem deum? When you consider how pleasant this all is and how expensive, don’t you regard the man who provides it as a manifest god on earth? Yes, the rich may appear divine: sunt divini divites … if they allow others, too, to benefit from their wealth and share it. Incidentally, similarly wishful thinking appears to be behind the name of the very district of Cologne in which we stayed: Köln-Deutz. 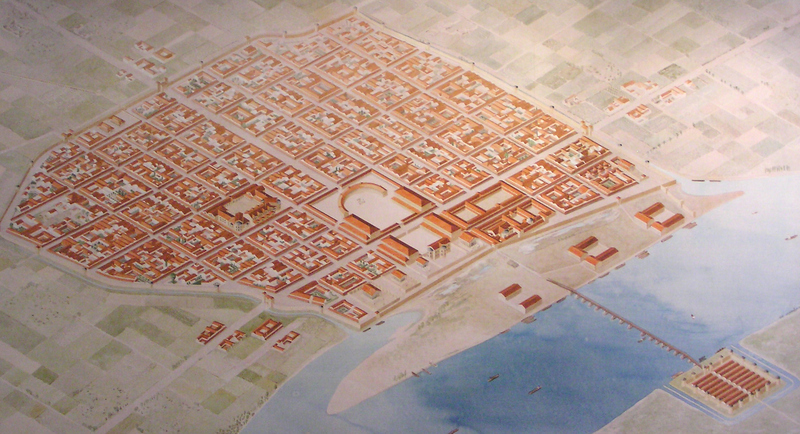 Historically, the name ‘Deutz’ is derived from the name of a Constantinian camp, Divitia, an expression of a wish for prosperous times, most likely, for a place that was situated just opposite Roman Cologne, on the right riverbank, and connected to the CCAA by a now long-gone bridge across the Rhine (of well over 200 metres’ length). This entry was posted in Education, Epigraphy, History of Reading, Poetry, Prose and tagged Afterlife, Big questions, Death, Plautus, Rich and poor, Terence. Bookmark the permalink.